We offer Hermine lever harps for rent. Created in 2003 following requests from harp teachers, the Hermine is an excellent student lever harp. 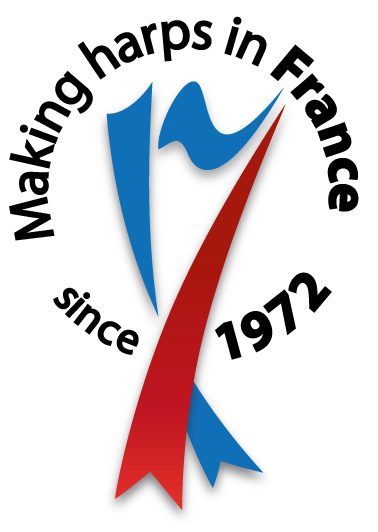 Its small size and light weight make it particularly suitable for younger players. Equipped with Alliance strings, it combines the roundness and power of gut strings with the robustness and stability of synthetic strings. This harp is available on low feet or higher legs. Minimum rental period: three months. The deposit and first month’s rental payment is payable on the date of the agreement. Subsequent rental payments are made monthly after this by Standing Order. The deposit is refundable at the end of the hire period, subject to the harp being returned in the same condition as it was received. 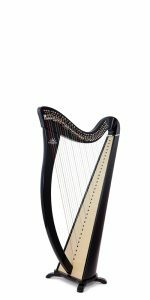 A proportion of the rental payments can be offered as a credit should you decide to purchase any of our folk harps (of the same value or greater than the harp being hired). These are: three months hire/full rental premiums credit; six months/two thirds credit; twelve months; one third credit. The hirer is responsible for replacing worn or broken strings with Camac-made new strings at their own expense. These are available from Telynau Vining. The hirer is responsible for insuring the instrument against loss or damage. If delivery of the harp is required there will be an additional charge payable in advance.